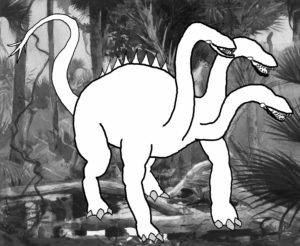 Instead, the Tricaput — all six tons of it — chooses a mile-wide area of land as its territory and defends it viciously against anything larger than a dog, flying into rages at the most innocent passer-through. It first charges its enemy, then uses all three heads to bite with sharp, rending teeth. Tricaput nests include distinctively dark green, almost spherical eggs, and are made of twigs and leaves the parent chews into a sort of mash. If you see one, get out of there as quickly as you can. Elesantra, an adventurous elf, followed the classic adventurer career: She spent years delving into dungeons, collecting various items of power, then eventually retired very comfortably. Having developed a taste for city life, she put her money in charge of a local banker, bought a small mansion, and placed her collection of magic items in a dungeon she’d helped clear some distance away. She even hired an enterprising band of goblins to rig a series of traps and generally guard the place. As upright and generous as Elesantra is, she has one flaw: she couldn’t stop mentioning her private dungeon at the many society parties she frequented. Fortunately, the aristocracy with which she associates know better than to steal from her; she’s far too well-known. Instead, the idea of dungeon-delving intrigued them, and they asked to see it. Surprised, Elesantra agreed and led a few friends on a tour, disarming traps and generally hamming it up. She even gave each of them a small coin once they reached her inner sanctum. Well, that little party came back and told all their friends, and suddenly “delving” into Elesantra’s dungeon was the Thing To Do. She was quickly overwhelmed with requests, and politely declined for a few months while she redirected the goblins’ efforts. Then, she made a big announcement. The dungeon was now open to anyone who wanted to delve into it; they didn’t need her. All the traps were now non-lethal, and the goblins instructed to lob sacks of paint instead of arrows and flee if anyone got within arm’s reach. At the end lies a “treasure room” filled with inexpensive wood and tin trinkets in the shape of swords and wands; those who reach it are expected to take only one item each. Elesantra still keeps her actual adventuring treasure in a whole other level beneath the public one, and that one’s full of real, deadly traps. As a friendly faction, the PCs will likely first encounter Elesantra as a source of information. She’s very well-connected among the local aristocracy, about a third of which have at least attempted her dungeon. Her elven memory allows her to remember exactly who said what to whom. She also frequently acquires special, particularly devious traps that are built into other dungeons in the area; she will hire adventuring parties to clear out the dungeon so she can send in engineers to remove the trap, reduce its lethality, and install it in her own complex. As a foe faction, Elesantra’s dungeon is a cover for a much more nefarious operation. She belongs to a degraded cult, which uses her actual dungeon to torture unfortunate souls into madness. The aristocratic adventuring parties above assume that the distant screams are part of the place’s ambience, faked by Elesantra. PCs planning to stop this (or rescue a prisoner) will have to first go through the public dungeon, consisting of very simple and annoying traps: tripwires that dump sacks of flour on them, pressure plates firing darts that deal 1 HP of damage, a riddle carved into a doorway which must be opened with a key inscribed with a missing word in the riddle, and so forth. Goblins will harass the PCs from a distance (and if the PCs attack the goblins with actual martial weapons, the latter will immediately run towards the lower level and fortify it). The treasure room contains a secret entrance downwards (and the PCs’ patron will likely have told them how to find and open it), leading into a level filled with very dangerous traps. These should be solvable but tricky and painful. Meanwhile, the goblins will keep their distance, firing ranged weapons and triggering traps where possible. These goblins are smart and have had many months to develop a defensive strategy. 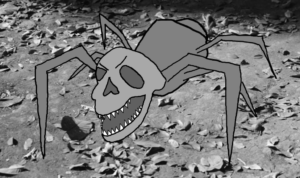 Spawned in abandoned graveyards and poorly maintained battlefields, skullspiders are large, venomous predators about the size of a cat. Unlike the single web of a typical spider, each skullspider will spread several thick webs over graves, crypts, bushes, and trees and feed indiscriminately on anything that gets caught there. They are also viciously territorial and will attack any creature that breaks any of their webs. 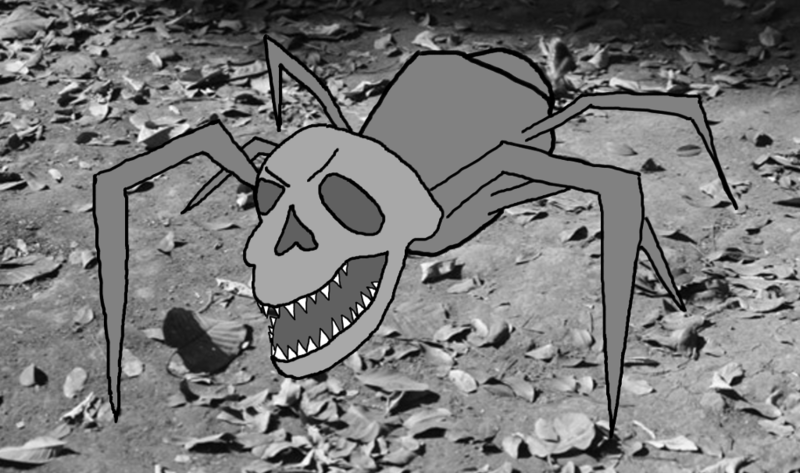 When attacking, a skullspider emits a high-pitched shriek and rattles its skull-shaped head. Any creatures seeing and hearing this must make an appropriate Fright check or become stunned for one round after the attack. If successfully bitten, the skullspider’s poison slows the target, then immobilizes it. Life’s tough for goblins who try to be good. Many of them turn to the merchant life as peddlers and gypsies, turning their natural eye for trinkets into a shrewd judge of value. Still, they take quite a while to earn the locals’ trust. Enter Gus, a minor half-elf spell-caster who never seemed to find success, leaving behind him disappointed parents, dissatisfied lovers, and frustrated adventurers, until he came upon a tribe of goblins that fell in love with him. This might have something to do with the crystal necklace he wears, which a certain Rakshasa named Paharu desperately wants to find. 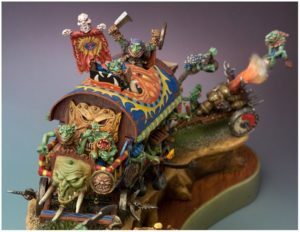 In any event, Gus’s Goblins have expanded from a simple caravan to a small carnival. 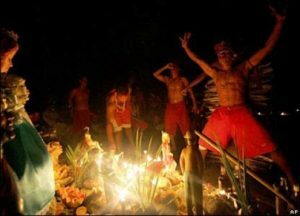 They roll into a village, half set up booths selling trinkets (particularly noise-makers, fans, and other items useful for an audience), and half put on a show that night. Combining their racial agility with a few spells Gus taught them, they perform some impressive acrobatic stunts, and one old goblin, Sharik, has even proved an immersive story-teller. As a friendly faction, Gus just wants to do a little good in the world. He procured (read: stole) a mesmerizing crystal from Prahana, then stumbled on a small tribe of orcs. Instead of killing them or running away, he decided to turn them into a positive force in the world. The crystal makes the goblins treat Gus as an ally, and his natural enthusiasm combined with these golbins’ fascination with magic has turned him into the tribe’s leader. And now that the goblins spend every night with full bellies, they’d die for him. That said, goblins aren’t exactly loved everywhere in the world, so the caravan struggles to find certain essentials, particularly supplies for their performances. A group of adventurers who happen to be in a village at the same time as Gus’s Goblins will likely find themselves approached by a goblin–or even Gus himself–and offer a reward for procuring juggling sticks (or some similar piece of equipment) from a purveyor of such things in a nearby city. Of course, that purveyor will be under attack from thugs when the PCs arrive. As a foe faction, Gus uses the goblins to hide from Paharu. Gus actually polymorphs into a gaudily-dressed goblin when in public (and during performances, where he acts as ringleader), but his wagon is much larger than the others and sized for his natural dimensions. The goblins are also less than noble. Every time they travel through a village, something goes missing. It’s rarely big enough to cause a serious fuss, and the goblins are smart enough to target the more senile or junior members of the village, but the average farm family can ill afford to lose any of their possessions. Worse, Gus is up to something; they’re stealing items that match a pattern, such as components for a powerful spell or parts for a construct. Somebody will eventually notice this and ask the PCs to investigate. The goblins will fight anyone who attempts to investigate their caravan, but will surrender if they realize they’re about to be killed. I’ve probably written about this on Google+ a few times, but I wanted to document it in full. The GM takes the PCs’ character description into account when describing NPC reactions, so if you’re very strong, you don’t need to roll to push open a stuck door. However, if a situation is in doubt, the GM rolls d100, where a lower roll is better. 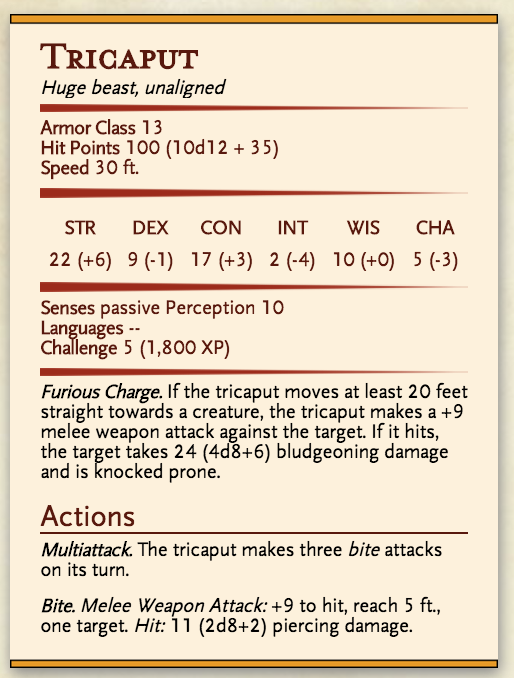 The GM still keeps the PCs’ character description in mind here; a low roll for a high-speed character will work out differently than one with low speed. You’re not trying to roll over or under a number. You’re just…rolling the dice. Combat operates at a higher level than typical blow-by-blow D&D encounters; you roll to see who gets injured, knocked out, etc. It can be just as cinematic as you want; you just have to be more clear about what you’re doing. Now, this puts a lot more pressure on the GM to build and run a fair, interesting session. But I feel like we have many of those tools already. Anyvay, it’s something to think about. Painsoppers are strange humanoids who live on pain. Usually encountered in groups of 3 to 10, they are indistinguishable from normal humans except for their irises, which are pure black, and the fact that they never speak. They always wear nondescript clothes, and often hang around at public executions, hospitals, and car accidents, but disperse as soon as authorities arrive. Some do strange, depraved things while draining their victims, such as drool, smile widely, kiss each other, or even rub themselves. However, painsoppers are natural bottom-feeders, and almost never engage in combat. If approached, they run. Moreover, they can magically merge with shadows and move invisibly to re-emerge up to 500 yards away, and can do this as often as they wish. A painsopper will die if he or she does not spend at least one hour per week in the presence of a sapient humanoid who is in mortal or near-mortal pain. While a nearby humanoid is in serious pain, any painsopper nearby regains half as many Hit Points (or appropriate Health score) as the humanoid loses. However, every painsopper loses one tenth of his or her Hit Points per day. 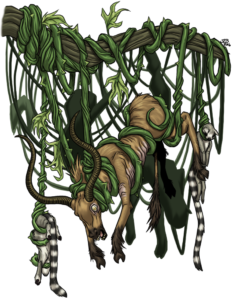 To increase its feeding times, it will magically stave off death in its victim; each victim reduced to 0 HP may make a Constitution check (or other appropriate roll) to stay conscious at 1 HP, and makes death saving throws at +2. 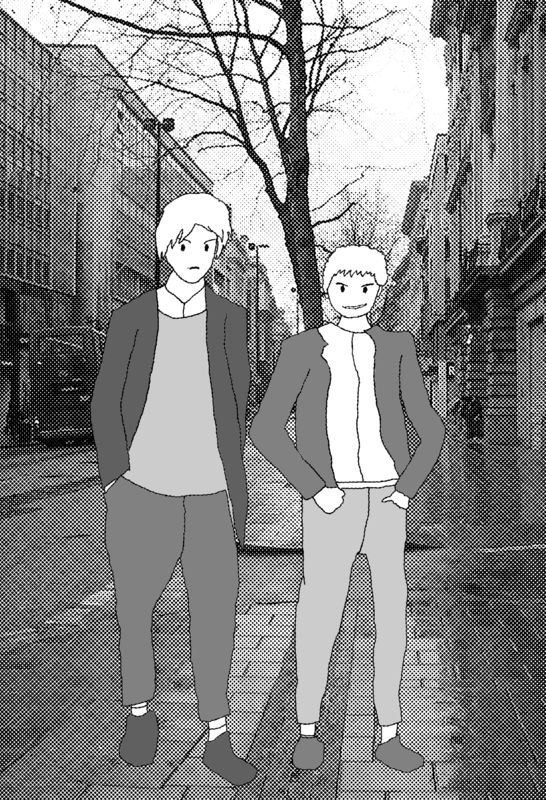 Painsoppers normally live as transients on the far outskirts of society. 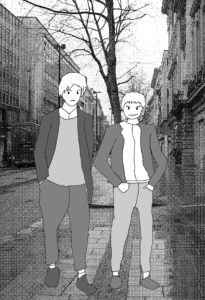 Thanks to their shadow step, they have no need to stay within civilization; instead, they will create the barest semblance of a homeless commune in an out-of-the-way spot and stay there between “feedings.” Nobody knows what they get up to there; anyone approaching will prompt the painsoppers to flee. Legends say that anyone who spends inordinate amounts of time near a place of many deaths, like a battlefield or a hospital, eventually becomes a painsopper. Others claim it’s a curse, or even the effects of a drug. Nobody can say for sure. Every city attracts a wide variety of religious believers, from the established to the fringe. The Gatekeepers are a canonical example of the latter. Using only heavy white caps as symbols of their fraternity, the Gatekeepers gather at various spots around the city which they’ve identified as “universal nexus points,” or “gates.” According to their texts, these gates connect this world to dangerous outer planes, but remain closed thanks to strange purification rituals that the Gatekeepers perform. Using an insanely complicated version of numerology, adherents identify new gates and abandon old ones every year or so, making them…difficult to ignore. The Gatekeepers believe they are awaiting the arrival of the Key, an individual who will open the gates and fight an apocalyptic battle with the evil forces beyond them. The exact nature of the Key remains a hotly debated topic within the group. As a friendly faction, the Gatekeepers are a harmless, goofy cult occasionally found on the odd street corner of any city. Their purification rituals involve silly walks, nonsensical chants, and burning unusual items like owlbear feathers and rare plants. 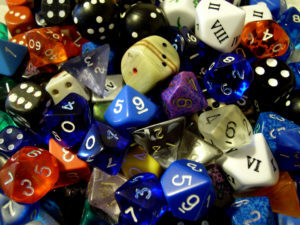 Fortunately for the player-characters, this means the head of the local Gatekeepers–a doughty, pleasant, somewhat addled middle-aged woman named Rem–can keep a low-level party busy for months collecting unusual ritual components and negotiating with the owner of a building that contains a new gate. As a foe faction, the Gatekeepers are a little more sinister. 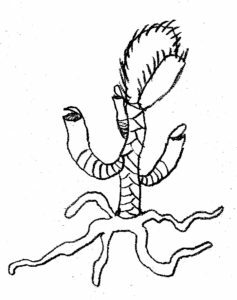 They insist on invading and “purifying” places they’ve identified as gates, and instead of burning feathers and spices they sometimes sacrifice small animals and offer human teeth, fingernails, and toenails. 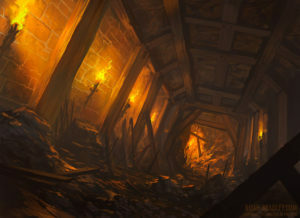 They often delve into dungeons beneath the city looking for gates, and will race against PCs to get to any treasure first (confiscating it for the Gatekeepers’ use, of course). You can also up the anté by actually having the Key show up. Turns out, the Gatekeepers were right all along, and a naïve teenager appears who actually does have the power to open the gates, which in turn causes eldritch horrors to pour into the world. Whether the Key can actually fight them off is your call. In most traditional RPG campaigns, PCs face broadly three kinds of challenges: physical combat, social conflict, and intellectual puzzles. The rules of the game usually cover physical combat in plenty of depth, and most groups can navigate difficult conversations without complex rule systems. Puzzles, meanwhile, beguile us. We imagine an ingeniously interconnected set of traps or a complex mechanism that fires the players’ imaginations and challenges their minds. We imagine our players hashing out different solutions among themselves before finally arriving at the solution. The reality rarely matches this dream. Players get frustrated after only a few minutes, mis-understand basic aspects of the puzzle, chase false leads for far too long, and often just route around it as much as possible. 1) People are different. Work with me on this obvious fact. People are very bad at understanding just how different other people are from them. 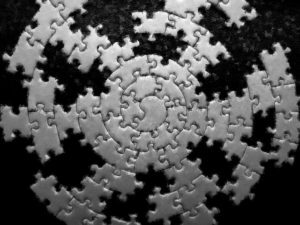 Others may come at a puzzle from a very different perspective than you will, making it very hard for you to find a puzzle that works for others. 2) A person who can solve a particular puzzle trivially over lunch is not in the same mental state three hours into an RPG session. After a few hours of mental gymnastics, it can be very hard to both marshal the mental resources and direct them appropriately for puzzle solving. Not only are you tired; you’re in a different mental state, thinking more about your character and the ongoing plot and what your character will do in the next room than about how to spin a set of discs so that the letters all align. As such, you can’t build a puzzle that will perfectly challenge all your players in whatever mental state they are when they encounter it. Does this mean you shouldn’t use puzzles in your game? Certainly not! The key is to keep them simple. It’s better to challenge your players with three simple puzzles than one longer, complex one. You can always up the ante after your players have shown themselves ready to handle it. 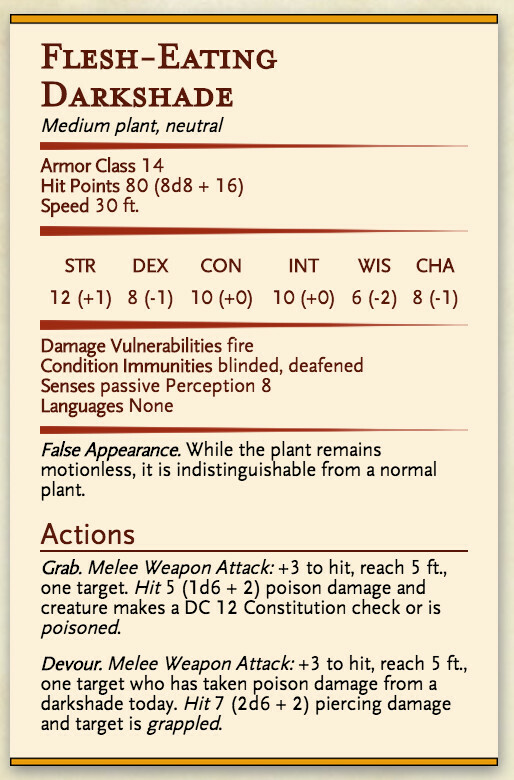 This carnivorous plant (about 3 meters/yards tall at full height) disguises itself as a normal tuberous plant, typically growing in the wilderness and occasionally in overgrown dungeon environments. When prey nears, it reaches out with its “arms,” which secretes a numbing poison (and can swallow tiny creatures whole). Then its large, serrated mouth lowers onto its prey. With no digestive system, it instead dissolves and digests the creature while it lies semi-conscious in its mouth, usually for several days. Darkshades rarely pose a significant danger on their own, but they are often encountered in areas that are already danger: trap rooms in a dungeon, near an animal’s lair, etc. In other words, you probably won’t face these things alone…. > – **Speed** 30 ft.
> ***False Appearance. 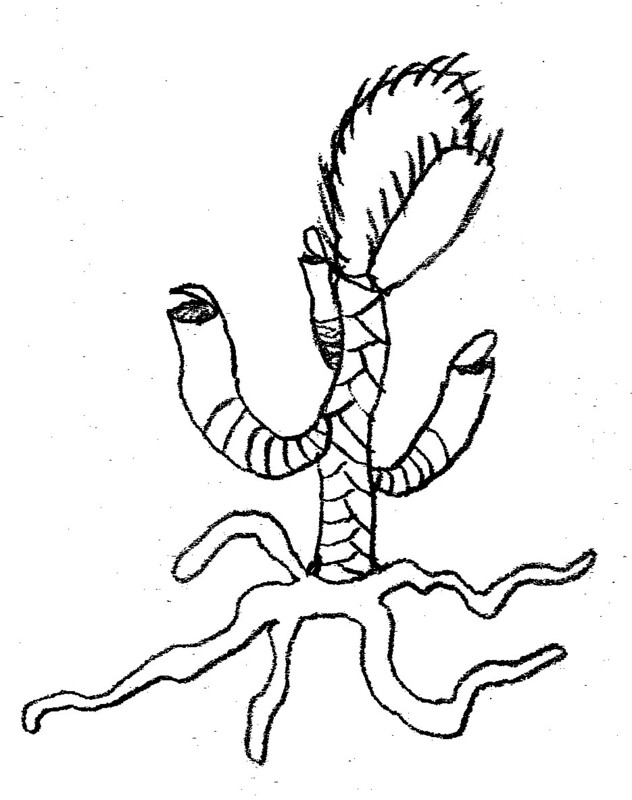 *** While the plant remains motionless, it is indistinguishable from a normal plant. > ***Grab. *** *Melee Weapon Attack:* +3 to hit, reach 5 ft., one target. *Hit* 5 (1d6 + 2) poison damage and creature makes a DC 12 Constitution check or is *poisoned*. > ***Devour. *** *Melee Weapon Attack:* +3 to hit, reach 5 ft., one target who has taken poison damage from a darkshade today. *Hit* 7 (2d6 + 2) piercing damage and target is *grappled*.